Odisha SSC invites application for the post of 24 Junior Engineer (Civil) Under Director of Fisheries, Odisa, Cuttack and Director of Textiles and Handlooms, Bhubaneswar. Apply Online before 30 November 2015. Educational Qualification : Candidates must have Diploma In Civil Engineering or equivalent qualification from the institution recognized by Odisha State council of technical education & Vocational Training. 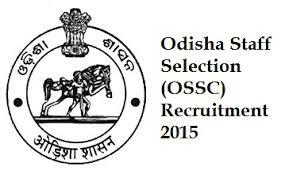 How to Apply : Interested candidate may apply Online through the website www.odishassc.in from 31.10.2015 to 30.11.2015 & Send the Hard copy Of application along with mark sheet & Other certificate to the Secretary, Odisha Staff Selection Commission, Barrack No.1, Unit-V, Bhubaneswar-751054 on or before 07.12.2015 .